Hice esta tarjetita para cumplir con el sketch challenge de #76 de Sketch Saturday y el Challenge #SSHP06 del blog Saturday Spotlight with Hidden Potential. Repetí el stamp con la frase Holiday Greetings para hacer el background del papel donde coloqué la imagen del ratoncito. 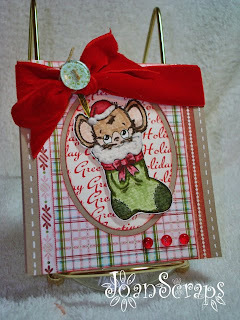 I made this card for the sketch challenge #76 from Sketch Saturday and the challenge SSHP06 from Saturday Spotlight with Hidden Potential. I repeated the phrase greetings holidays to create the background paper where I placed the image. Very cute image- great coloring! Que linda te quedo!! y el ratoncito chulisimo!!!! Wow what a darling image and your coloring is perfect love this card. Oh my gosh ... how adorable!! So bright and cheerful! Thanks for sharing it with us at Saturday Spotlight! This is so sweet!! 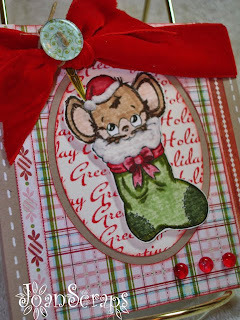 Love your mouse image, the Eskimo Kisses Dp and your colors!! The repeated sentiment is perfect for the challenge! Thanks for playing with the Sat. Spotlight! The repeated sentiment makes a perfect backdrop for this little cutie! Thanks for playing in this week's Spotlight Challenge! !